We would like to share this great article with you, borrowed from our friends at Restaurant Hospitality! A church buying up cafe table tops, bar stools, and dining chairs? Yes, it does happen! Building community and attracting new audiences are two very important objectives for many churches, regardless of denomination. Many churches across the U. S. (and globally) have acted on a growing trend to help address these goals: open a cafe or coffee house inside the church. Depending on your church community’s own goals, a coffee house could also be a much-needed revenue stream for a declining membership or growing capital needs. Chances are, when your congregation walks out your chapel doors on Sunday morning, they are heading to the nearest Starbucks or local coffee house to get their fix before the rest of the day. Or perhaps, they came to church holding their white to-go cup adorned with that famous green mermaid. Younger generations, especially, feel comfortable in a cafe atmosphere and often include a weekly, if not daily, visit to a cafe or coffee house. Bringing this atmosphere to a church can make the Sunday ritual a little less intimidating or threatening to some, and can offer a convenience factor to those coffee connoisseurs in your congregation. If you’re reading this, you are probably already tasting your drink of choice – whether it’s a chilled frappuccino, a frothy cappuccino with your favorite flavor shot, or a bold cup of espresso. Even tea drinkers find comfort at a cafe, and many serve up smoothies for those looking for a fruity taste instead (which is also a great kids’ choice for younger families). Imagine your sermon ends, and people don’t rush out the door. Instead, they chat with their neighbors over coffee in your narthex, or a church-run separate cafe. Imagine Bible Study ends, but the conversation continues over a cappuccino or hot tea. Imagine a pastor reaching out to get to know someone in his fellowship, and being able to offer a cup of joe in a relaxed atmosphere while trying to do so. Having a resource of this kind inside your chapel’s walls can be a great boost to your own congregation and provide ample opportunities to bring people together and inspire people to truly connect. Cut out the small talk about the weather and the “I’m good” automatic responses, and really get to know your church-goers a little better. Coffee houses don’t just sell coffee. They have Wi-fi, promote new music, and keep people connected – in a more global way than previously mentioned. To do a cafe right, you need to offer free Wi-fi to your customers, so they can bring in their laptops and surf the ‘net or do other work in the peacefulness a church cafe can inhabit. You can also stream contemporary Christian hits and perhaps offer free downloads of your own choir’s musical performances. At times, bring in local musicians to host live events and draw more customers. If your church’s bookstore is flailing, consider linking up with an online book retailer to bring the great written copy onto someone’s Kindle or Nook. (Coffee houses can also inspire people to sit down and actually open up that book they’ve been meaning to read, and could work well in conjunction with a church bookstore or lending library.) If your church is too conservative to try to bring in modern elements to its sermon, a cafe can be a great extension of your services and attract a less-conservative crowd. If you’re already breaking down barriers with A/V additions to your Sunday mornings, then a cafe will fit into your personality and be a smooth transition for your audience. Does your church have activities throughout the week? Do you want to be more visible all week long? Having open cafe hours can not only just attract outsiders for some coffee (and money for your church’s revenue stream), but it can be a great perk to your staff, volunteers, and people coming to church throughout the week for activities or private confessionals/prayers. Many churches recommend hiring a few key staff who are responsible for the cafe, but others can operate it solely through the hands of volunteers. Finding what works for you, your church, your goals, and your budget will be beneficial. If you can envision a cafe in your church, already enjoy the aroma of the beans wafting through your chapel, hear the clink of coffee mugs and friendly conversation, and begin to see the benefits of how a church cafe could promote a happier congregation, attract new/younger church-goers, and boost your fundraising efforts, then we hope this article was helpful and wish you success in your exciting new venture! What size tables do I need? How many people can fit comfortably at each table? How many tables can I fit in my space? How much room do I need to leave between tables? These are all questions that run through your mind as you design the layout of your restaurant or banquet center. Choosing the correct elements is crucial for efficient operations and creating the ideal atmosphere for your guests. Here is a checklist of considerations you will need to address during planning. Figuring out your goals of the space will save a lot of headaches in the end. You want to take stock of your main priorities with your space before taking any action. Determine what you as a business require from the space and run with it. Determine the square footage of your area. Physically, you must know how much room you have to work with in order to organize it. Make a list of all the functions you plan on using the space for (e.g., restaurant dining, banquet style seating, classroom/seminar seating, with or without dance floor, bar and cocktail areas, buffet or stage areas). Know what your brand is and how you want to portray that. The atmosphere that you are trying to convey to your public can be used as the inspiration for creating the layout. Understand customer expectations. There’s a fine line between what customers want from you and what you are able to do for them; find that line. Brainstorm, brainstorm, and brainstorm! This is not something to just jump into; it requires time and effective planning to lay the creative foundation for your dream space. Now is the perfect stage to mentally move your ideas around without having to do any heavy lifting. It’s always helpful to have some requirements to keep mind while you’re getting the measurements you need for your space. Here are some industry-standards to help you when it comes to furniture placement. Map it out with the right materials. 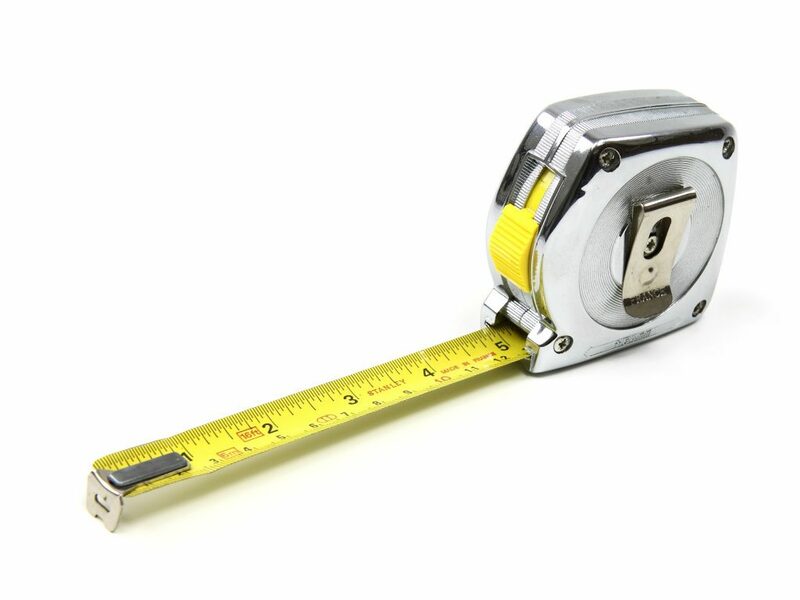 While taking the above measurements in mind, don’t forget to start with basics. Pull out the graph paper and set a scale to determine the approximate number of tables and chairs that will fit. The most important part of selecting a table shape and size is that the tables have adequate space and go with your vision for your particular establishment. Square tables offer the most flexibility and are easiest to move around or rearrange. For a durable, streamlined option that’s easy to push together, check out our Isotop collection. Round tables are often considered the most elegant and are great for banquet seating. Drop leaf round tables can offer some additional flexibility in case you need to accommodate a large party. Rectangular tables are most common for the everyday dining experience because of their versatility. Our rustic farm tables are a popular choice for large or small seating needs. 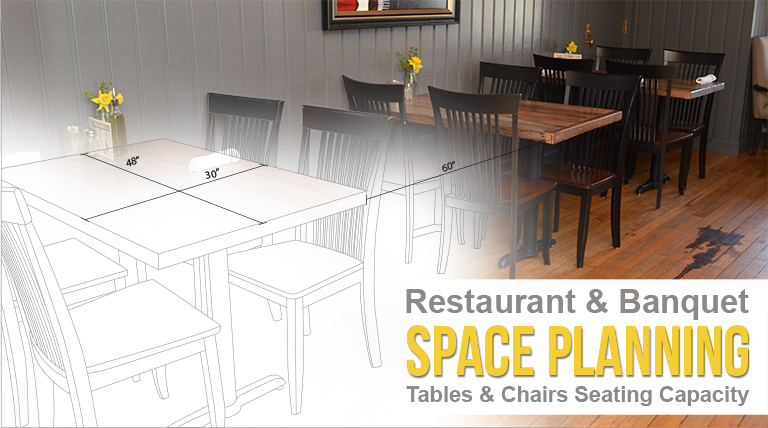 Follow our recommended table seating capacity chart, and think about how and what you serve to your customers. Are you just a coffee and dessert establishment, or are you a fine dining restaurant that offers 8-course meals? Envision everything that will be taking up space on your table tops. Will you have candles, salt and pepper shakers, water pitchers, wine cantors, etc? Do you serve full-course breakfasts that come on three plates per person? Or do you serve bar food that takes up less space? Keep all these things in mind when you choose your table size and how many chairs you put around each one. While it is recommended that each person have 2 feet of the table’s circumference or perimeter, or an estimated 300 square inches of table top space, your patrons may require more space depending on what you are serving. On the same token, elementary school cafeterias would not need to offer as much space per person as a college or corporate cafeteria. These concepts are subjective to your needs. 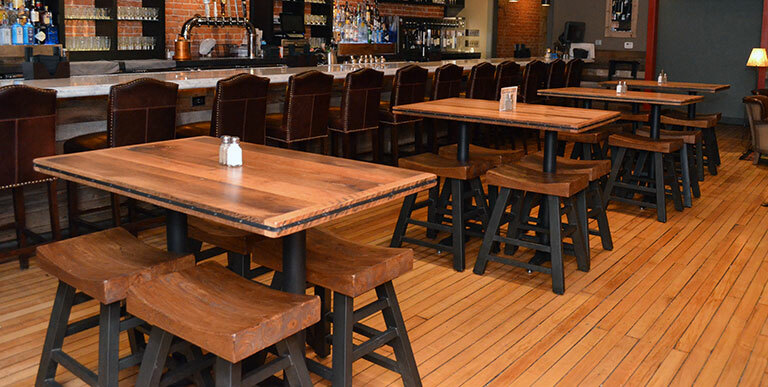 Many restaurants incorporate varying sizes of tables to allow for maximum seating capacity, the flexibility to serve differing sizes of parties at the same time, and to create a more aesthetically appealing restaurant space. A variety of seating styles can change up any area. Mixing booth or “anchored” tables (edge of table against wall) with floating tables is a great way to maximize space. Placing square tables diagonally also saves floor space and can restrict views from one table to another to create a more private dining experience for your guests. Check the local codes and be sure you always comply with the Americans with Disability Act (ADA). As a rule, 5% of the total space should be accessible to people in wheelchairs. Wheelchairs typically require a 36″ clearance for aisle space in dining areas. Be sure the section of your establishment that is ADA-compliant is accessible to the entrance/exit and also public areas, such as the bathroom or cashier’s counter. Do you foresee rearranging tables frequently for different events? Be sure to purchase lightweight tables and chairs that will be easy to haul around, and choose ones that will not mar your floors. You may also be interested in purchasing a chair and table dolly to lighten your staff’s load. Want to be prepared for extra customers? Keep a few lightweight stacking chairs in storage in case you need to pull them out to accommodate larger parties. Not expecting a lot of movement? If you are a finer dining establishment, you may want to choose the larger table per recommended number of guests and purchase heavier chairs that create an illusion of being more prestigious and luxurious. While these guidelines and recommendations are helpful starting points, laying out a unique restaurant or banquet space for your particular establishment and utilizing the space you have for your specific goals will take a lot of thought. Don’t be afraid to think outside the box and design a great looking restaurant or banquet space that effectively meets you and your guests’ expectations! Check out our site for more tips and furniture to fill up your newly planned out space!